Everyone holds on to a few things every now and then just in case they may come in handy later on but when it all piles up and you realise you haven’t used any of the things you’ve been storing away, Go Rubbish Go can help you! We are a well-established company in the DA1 area, helping people like you declutter their homes every day. We have the team and equipment suitable for any sized Crayford house clearance you require! All you have to do is pick up the phone and call 020 8610 9182 today to talk to one of our staff about booking your house clearance in DA1! It is quite a common misconception that hiring help in any area leaves your wallet screaming. Our prices however, are nothing but proof that this isn’t the case at all. Not only do we offer extremely competitive DA1 house clearance prices, but we also have a team who specialise in the Crayford house clearance field! You no longer have to choose between quality and price when we offer both hand in hand! You no longer have an excuse to put off getting rid of all of your junk when you have a cheap, reliable team right behind you, taking care of everything from start to finish! Nowadays, it is really important to recycle as much as you can but sorting through everything individually and disposing of it in the most appropriate manner is a very time labouring task. All of this can of course be avoided though with one quick phone call to Go Rubbish Go! Our well trained DA1 house clearance team sort through everything that you want disposed of and they make all of the environmentally friendly decisions so that you don’t have to! House clearance in Crayford couldn’t be simpler and more environmentally focused! Call 020 8610 9182 now to get your free quote! Why Are We the Best House Clearance Team in Crayford? All of our DA1 house clearance staff meets our high requirement standards and goes through thorough training before and throughout employment. 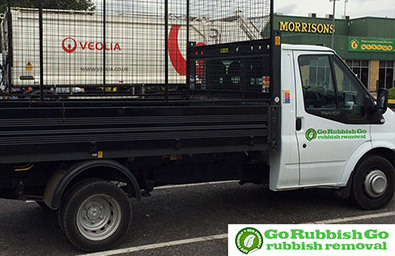 Go Rubbish Go ensures all staff holds the highest standard of customer service and each individual is both trustworthy and reliable. 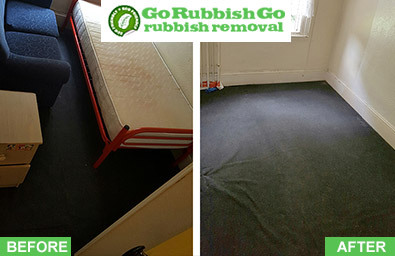 Not only do we provide flexible, thorough, and cheap services, but we also have great turn-around times so that firstly, you don’t have to wait weeks before we can come out and secondly, you don’t have to worry about the job being too big and taking too long to finish. We are Crayford house clearance experts and it reflects in our quality work we provide. Contact us on 020 8610 9182 to get a free quote! Obviously, if you’re looking for assistance with house clearance in Crayford, you look for a standard list of requirements. This is where we go above and beyond that. We have operated in Crayford for years and we have proudly built up a reputation as a high quality company through our hard work and great staff. Hiring us means that your house will be clutter-free in no time at all for a steal of a price! House clearance DA1 is made so easy; you don’t even have to lift a finger! We come at a time convenient for you and take care of everything start to finish so you don’t have to worry about anything from clearing all the way through to the disposal of waste and unwanted belongings! Everyone knows how much time is required to put into a thorough Crayford house clearance and a lot of the time, your schedule is too busy to get around the whole house in one. After you find time, you still then have to sort through everything and haul it all out of the house which is something we will completely take care of for you! Our DA1 house clearance even means that you don’t have to sort through what can be recycled or have to worry about skip or van hire to properly dispose of your waste, we come fully equipped! Your home in DA1 will be in great hands and it will be well reflected by the results so call 020 8610 9182 now to book! What Can You Find in Crayford? 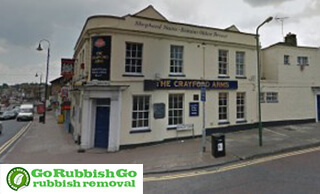 Crayford is situated in South East London, in the London Borough of Bexley. There is a lot to do for all the ages in Crayford, there is a vast choice of public houses to choose from around the area which are perfect for catching events going on or just socialising with the locals. There are also a number of religious places of worship, with a mosque and 4 churches of various denominations. If you’re a sports lover, then you won’t be disappointed with the sports choice going in. Crayford Stadium is located in the DA1 area is one of the only greyhound racing locations in the country and have been holding races since 1937. There are also a number of sports teams in the area, for anyone that wants to get involved or to try something new in things such as football, jujitsu, and speedway racing. The area is home to Haberdashers’ Aske’s Crayford Academy. Crayford is served by Crayford station and 3 Transport for London bus services: 96, 428 and 492.